Against a backdrop of terrorist threats, oil spills and continued economic uncertainty both in the U.S. and worldwide, funding music and art programs in public schools might not be considered a top priority by our nation's elected officials. 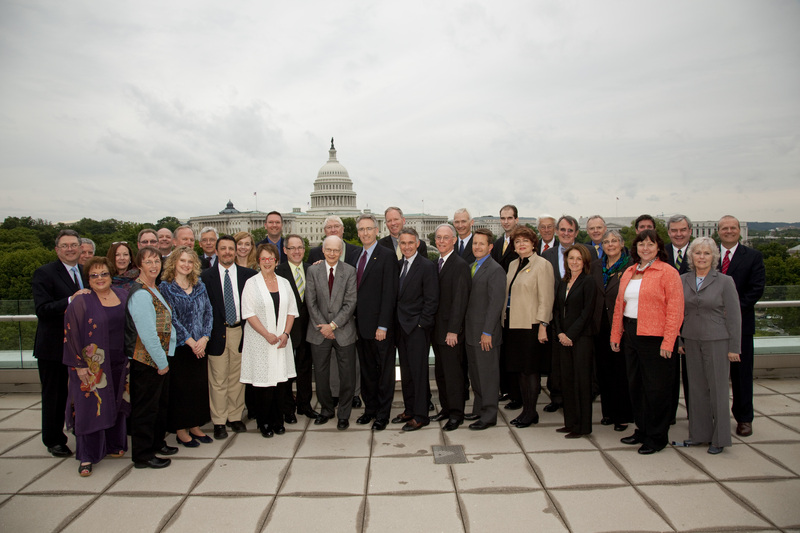 However, more than 30 NAMM Members took time away from their businesses and day-to-day schedules May 10-13 to travel to Washington D.C. and engage lawmakers in discussions about this important topic as part of NAMM's annual Member "Fly-In." The week's activities kicked off on Monday with a reception honoring former MENC Executive Director John Mahlmann in the shadow of the U.S. Capitol Building. In addition to the NAMM Members in attendance, many of Mahlmann's close friends and associates including "Sesame Street's" Bob McGrath, famous "Funky Winkerbean" cartoon creator Tom Batiuk and representatives from GAMA, VH1 Save the Music Foundation, Music for All and MENC. "The entire music products industry owes a great debt of gratitude to John for his patience, wisdom and leadership always with a cool head and kind way," said Joe Lamond, president and CEO of NAMM. On Tuesday, the group underwent an entire day of training and briefings about the issues facing music education funding currently. NAMM streamed portions of this meeting on namm.org and encouraged questions via e-mail and Twitter. Mid-day on Tuesday, the delegation took a trip from their briefing room to the Department of Education offices to take part in a press event featuring U.S. Secretary of Education Arne Duncan outside of the John Lennon Educational Tour Bus. "I'd like to thank all the students, teachers and NAMM for your passion in this area," said Duncan. "We're trying to put a lot of money around giving kids a well-rounded education—not just high school, but our 5, 6 and 7 year-olds too. I wish it wasn't a fight, but let's face it—it is a fight. This is about giving these kids a chance to develop their skills, their abilities and their self-esteem. Together, we have to win this and win it for every single child in this country." Wednesday the delegates held more than 80 meetings in various offices around the Capitol culminating in a special reception at the end of the day in the Capitol Building put on by NAMM, VH1 Save the Music Foundation and dosomething.org featuring GRAMMY-nominated singer Taylor Dayne and Journey keyboardist/songwriter Jonathan Cain. The crowded roomful of NAMM delegates and Washington insiders listened to passionate remarks from both celebrities about why music education matters to them. "Miss Kyzowski, Mr. Dagan, Miss Edwards. 30 years later I can still remember their names because these people were three of the most influential people in my life. They were my music teachers and they helped me find my own voice. My music teachers believed in me more than I believed in myself and music class was my safe place." "In 1958, I went to a school that burned to the ground and 100 kids died. My way out of it was music. My father bought me an accordion after the fire and it became my best friend. Music was my escape and my salvation. And that's what we have to remember when decisions are made to cut music classes out of schools." On Thursday, the delegates held their last few Congressional meetings and re-grouped at the law offices of Nelson Mullins Riley and Scarborough for a final feedback session. Two new Fly-In attendees shared what they learned from their first Washington experience with NAMM. "Two things about my Fly-In experience really impressed me. First, I got everything out of this experience that I expected and that almost never happens. The second was that once I was able to get over that initial intimidation factor of meeting with Congress here in Washington, I found it very comfortable. I'm confident that I can now meet with my elected representatives more regularly and stay engaged in the issues that I care about the most, including strong music education programs in our schools. " Grant Billings, Steinway Piano Gallery, Madison, Wis.
"First of all, to be on Capitol Hill with the legislators and staff was really awe-inspiring. And to walk through the halls of government is humbling to any American. The mission we have undertaken, as far as making sure music education has a solid mindshare with these legislators, is a good one for our industry and for our society and I think we accomplished it. We were able to have really good discussions this week and get our message across clearly to the lawmakers who ultimately will decide if as a country we are going to make music and arts programs a top priority. Lastly, I feel that NAMM is doing something that is so critically important to the health of our entire industry and that's exactly what NAMM should be doing." Rick Young, Yamaha, Buena Park, Calif. When it was all over, the delegates left Washington with a deeper understanding of these issues, positive energy, new friendships and a renewed passion shared by our industry to ensure every child has the opportunity to experience the powerful, proven benefits of music education.